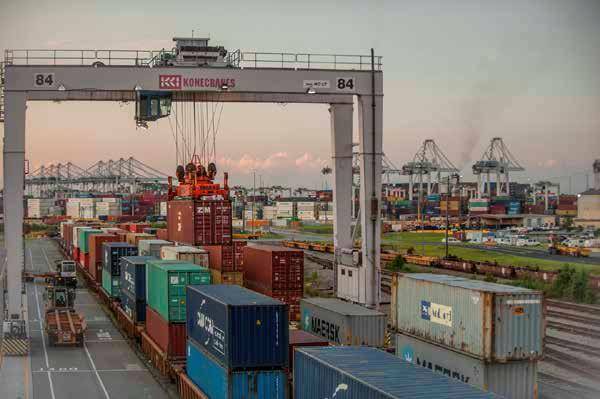 The Georgia Ports Authority reported that its terminals in Brunswick and Savannah moved a combined 2.79 million tons of freight in October, a record for the authority. "Strong growth across all key sectors of our business is an indication that our ports are reaching a larger and more diverse customer base," said GPA Executive Director Curtis Foltz. For the fiscal year to date, the GPA has moved 10.28 million tons, up 7.2 percent or 694,045 tons. Savannah's Garden City Terminal handled a record 311,759 twenty-foot equivalent container units (TEUs) in October - a 13.6 percent increase (37,432 TEUs) compared to the same month a year ago. For the fiscal year to date, the GPA has moved 1.2 million TEUs, an increase of 13.1 percent, or 138,554 TEUs, over the same period last year. At today's board meeting, the GPA approved construction of Gate 8, a $10.2 million project that will serve as the third major truck interchange at Garden City Terminal. Infrastructure design and planning for the new gate are currently in final draft. The project is expected to be completed by the end of 2015.